Researchers provide strongest evidence yet of neurogenetic cause of Schizophrenia. An international team of scientists led by Cardiff University researchers has provided the strongest evidence yet of what causes schizophrenia, a condition that affects around 1% of the global population. The team states that their work presents strong evidence that disruption of a delicate chemical balance in the brain is heavily implicated in the disorder. In the largest ever study of its kind, the team found that disease-linked mutations disrupt specific sets of genes contributing to excitatory and inhibitory signalling, the balance of which plays a crucial role in healthy brain development and function. The opensource study is published in the journal Neuron. Around 635,000 people in the UK will at some stage in their lives be affected by schizophrenia, state the team. The estimated cost of schizophrenia and psychosis to society is around £11.8 billion a year. The symptoms of schizophrenia can be extremely disruptive, and have a large impact on a person’s ability to carry out everyday tasks, such as going to work, maintaining relationships and caring for themselves or others. The researchers state that the study marks a significant step towards understanding the biology underpinning schizophrenia, which is an incredibly complex condition and has up until very recently kept scientists largely mystified as to its origins. They go on to add that the data findings provide a pretty sizeable piece of the jigsaw puzzle that will help the medical community develop a coherent model of the disease, while helping them to rule out some of the alternatives. The team stress that a reliable model of disease is urgently needed to direct future efforts in developing new treatments, which haven’t really improved a great deal since the 1970s. They state that this work builds on the understanding of the genetic causes of schizophrenia, unravelling how a combination of genetic faults can disrupt the chemical balance of the brain. In the future the team states that this work could lead to new ways of predicting an individual’s risk of developing schizophrenia and form the basis of new targeted treatments that are based on an individual’s genetic makeup. Previous studies show that a healthy brain is able to function properly thanks to a precise balance between chemical signals that excite and inhibit nerve cell activity. Researchers studying psychiatric disorders have previously suspected that disruption of this balance contributes to schizophrenia. The first evidence that schizophrenia mutations interfere with excitatory signalling was uncovered in 2011 by the same team. This current study not only confirms their previous findings, but also provides the first strong genetic evidence that disruption of inhibitory signalling contributes to the disorder. To reach their conclusions scientists compared the genetic data of 11,355 patients with schizophrenia against a control group of 16,416 people without the condition. The researchers looked for types of mutation known as copy number variants (CNVs), mutations in which large stretches of DNA are either deleted or duplicated. Comparing the CNVs found in people with schizophrenia to those found in unaffected people, the team was able to show that the mutations in individuals with the disorder tended to disrupt genes involved in specific aspects of brain function. The team add that the disease-causing effects of CNVs are also suspected to be involved in other neurodevelopmental disorders such as intellectual disability, Autism Spectrum Disorder and ADHD. Functional Interactions between Neuronal Complexes Implicated in Schizophrenia. Supporting and extending previous studies (Fromer et al., 2014; Kirov et al., 2012; Purcell et al., 2014), our analyses indicate a contribution to schizophrenia from ARC, NMDAR network, PSD-95, and GABA A neuronal complexes. Although not strongly associated here, targets of the translational repressor FMRP have previously been found to be enriched in CNVs and rare de novo small mutations in individuals with schizophrenia (Fromer et al., 2014; Purcell et al., 2014; Szatkiewicz et al., 2014). This figure summarizes the relationship between these sets of molecules and their roles in synaptic signaling and plasticity. (A) PSD-95 complexes are an important component of the postsynaptic scaffold at glutamatergic synapses, linking a wide range of channels and receptors including NMDARs (top left). Calcium influx via the NMDAR drives multiple downstream pathways (red arrows): local signaling regulates induction of synaptic potentiation, while activation of ARC transcription via signaling to the nucleus is required for the long-term maintenance of synaptic changes. Once transcribed, mRNAs encoding ARC and other synaptic proteins are inactivated via association with FMRP and transported to synaptodendritic sites of protein synthesis. Here, activity-dependent dissociation of FMRP releases transcripts from translational repression allowing protein synthesis and incorporation into active synapses. (B) NMDAR activation requires both presynaptic glutamate release and strong post-synaptic depolarization, which may be induced by the back-propagation of action potentials. Influx of chloride ions via GABA receptors attenuates the dendritic transmission of excitation, inhibiting action potential generation and back-propagation. Phasic firing of synaptic GABA receptors plays a key role in establishing neural oscillations, required for the coordination of distributed functionalnetworks. Tonic GABA receptors also modulate excitatory currents and oscillatory neuronal behavior, being responsive to local network activity via the overspill of GABA from synaptic receptors and its release/uptake by glia (blue cell in A). 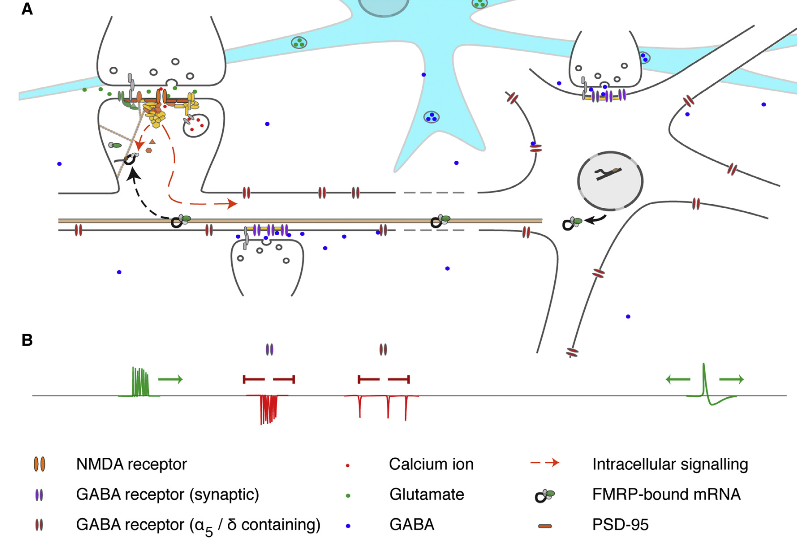 For simplicity all receptors are shown acting upon a single neuron; in reality, their interplay is distributed across multiple neuronal cell types, e.g., tonic GABA currents also modulating synaptic GABA release from interneurons. Novel Findings from CNVs Implicate Inhibitory and Excitatory Signaling Complexes in Schizophrenia. Pocklington et al 2015.